Product #21117 | SKU G1XON | 0.0 (no ratings yet) Thanks for your rating! 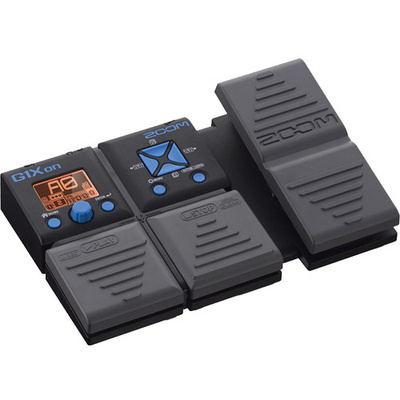 The Zoom G1Xon Multi-Effects Guitar Pedal with Expression Pedal offers guitarists 105 high-quality effects, including varieties of distortion, compression, modulation, delay, reverb and amp models. It allows you to chain up to 5 effects simultaneously for customising your sound to fit your personal playing style. You can connect headphones to the output jack and practice along with the 68 built-in rhythm accompaniment patterns, or you can connect your portable music player to the auxiliary input jack if you want to jam along with your own backing tracks. Additionally, the unit comes with five expression pedal-controlled effects, allowing for more expressive riffs and solos. The G1Xon boasts an onboard chromatic tuner that supports all standard guitar tunings, including open and drop tunings. It has a phrase looper that enables you to record up to 30 seconds of CD-quality audio, and it can be powered by 4 AA batteries (not included).